No Easy Beads: What another Dragonfly? On Bead Cruise 2010 Melanie Brooks of Earthenwood Studio gave a demo using Vintaj brass to wrap one of her beautiful cabochons. She made something that I thought was difficult seem so simple that I had to give it a try. I am very pleased with how my piece turned out. I have been a fan of Melanie's work for a very long time. 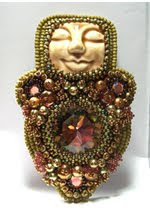 I have enjoyed using her Art pieces in previous Bead Cruise projects. Thank you Melanie for being a 2010 Bead Cruise sponsor. 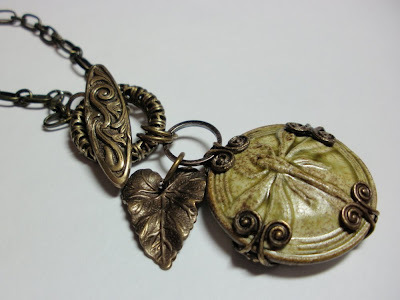 I love the leafy face cabochon gift. 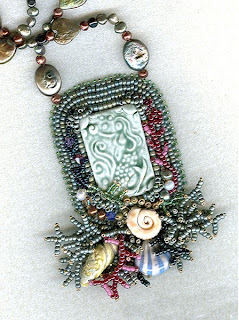 Please stop and visit Melanie's blog and read about what goes on in her studio. For a quick fix stop by her Etsy shop. You will find some way cool new resin pendants. Planning your next project visit Earthenstudio and place an order. 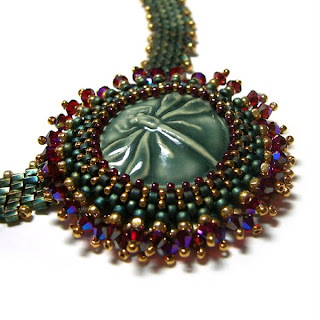 You will be sure to find that special piece to incorporate in your jewelry designs. Wow, Beverly - I haven't seen that piece called Triton's Daughter yet - that is brilliant and amazing! Melanie is the best when it comes to her pendants and Vintaj. I love the necklace. I need to get out my pliers too. Love the necklace. you do such a great job of bringing out the best in those art beads!